Veggie burgers are not hamburger substitutes, I don't care what any restaurant claims. You can fire grill it, BBQ it, smother it with ketchup until you can barely taste it, but in the end, it's just not a beef patty. It's a veggie patty. Now, to my knowledge, chicken burgers do not try to be beef burgers and broccoli doesn't attempt to replace steak. So I must ask then, why do so many ground soy products strive to be "just like beef?" When I eat veggie burgers, I do so because I enjoy the burger itself. I do not eat them in order to replace a hamburger. If I wanted a hamburger, I'd eat a hamburger . A major factor that sent me on the path to vegetarianism was that I did not enjoy the taste nor the texture of meat - so why on earth would I want to eat a highly processed product that was masquerading around, pretending to be that demon that I tried so hard to avoid? That being said, let me tell you something about veggie burgers - some of them, and I emphasize some, are really quite delicious. It's when people begin to expect that their veggie burger should taste like meat that they are disappointed, and all possibilities of enjoyment are thrown out the window. The thing that makes veggie burgers fun is that there are so many different varieties that can be prepared. My all time favorite vegetarian burger was one made of lentils. I feasted on this fantastic creation at a trendy comfort-chic spot in Montreal - a place where you can order a 20$ hamburger alongside a glass of Dom Perignon, all off of a menu that's written on a chalkboard. I really love this city. Today, inspired by my "buy-nothing" week, a long and deep stare into my kitchen pantry brought me to the conclusion that I stock a lot of beans and legumes, but I rarely eat them. I decided it was time to change that. A little inspiration from the January issue of Chatelaine is allowing me to present to you, the superfantastic Pinto & Black Bean Burger! At about 150 calories each, chock full of fibre, and of course, filled with the antioxidant power of black beans, you'll wonder how on earth something that is so good for you can be so delicious! GLUTEN FREE NOTE: You can make this gluten free by omitting the breadcrumbs and substituting a few crushed gluten-free crackers instead. 1/4 cup breadcrumbs (more if batter is too sticky). Cook pasta in until very soft, 15 min. Drain cooked pasta and rinse under cold running water. Dry pasta with paper towels, soaking up as much water as possible. Place pasta, onion, pinto beans, ketchup, cilantro, garlic, juice and salt in a large food processor. Pulse until smooth. Stir in black beans and breadcrumbs. Shape into patties. Heat a non-stick frying pan over medium. Add 1 tbsp oil, then 3 patties. Cook for 3 min, then flip patties and cook until firm, about 3 more min. Repeat with remaining oil and patties. Serve on a bun, or with a sauce or gravy on top! 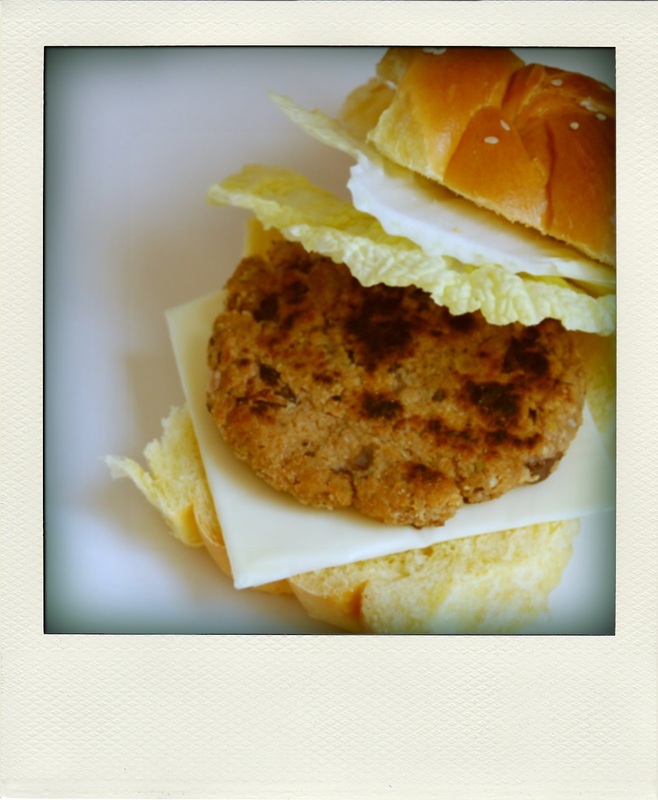 We have been playing around with our veggie burger recipe in preparation of summer bbq'ing. and you are so right to say they are a burger is really wrong, they aren't hamburger they are vegetables. This sounds utterly delicious, but I have to watch my sodium. So I will be tweaking this to be lower in salt. I very much agree with your sentiments and that is a common question I often hear from the carnivores - 'If you're vegetarian, why do you try to imitate meat?' As an ex-meater turned veggie turned 'fell off the wagon,' I must say Licks and Harveys veg-burgs are the closest to the real thing, but otherwise, no comparison and there shouldn't be. Only a hamburger is a hamburger. But burger or not, they really have come a long way the last two decades. I love our homemade chick pea 'burgers' here at home and they are superior to any meat-burger I've ever had. In other news, saw your '09 post about the Bacon Salt. Thanx for the tip. I read somewhere that in the old days they would make popcorn using bacon grease, and I've had a bit of a craving for bacon flavoured popcorn ever since. I hope this message finds you safe, happy and healthy.